There’s more to our white Roller blinds range than you might think. Browse the collection – you’ll be surprised by the variety of shades available. In among the pure white Roller blinds are designs in ivory, eggshell, ice, pearl and of course cream. These are white Roller blinds, but with a little extra colour. Gentle undertones of yellow, blue and green soften the shade and add complexity. It’s this quality that makes the styles so good and so easy to match with so many interiors. And then there are our patterned white Roller blinds. In our white Roller blinds range, you’ll find subtly textured designs, geometrics, florals, stripes and more. 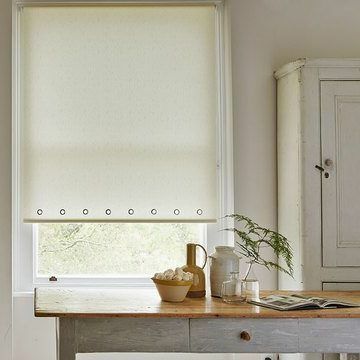 For something more practical, choose from our white Roller blinds with specialist fabrics. Consider our blackout designs for the bedroom and our water repellent styles for the bathroom or kitchen. So take a look at our collection. You’ll see what we mean about our white Roller blinds range. Browsing white Roller blinds online is great. But seeing the collection up close and touching the designs is an even better way to choose. Book an in-home appointment and see what we mean. 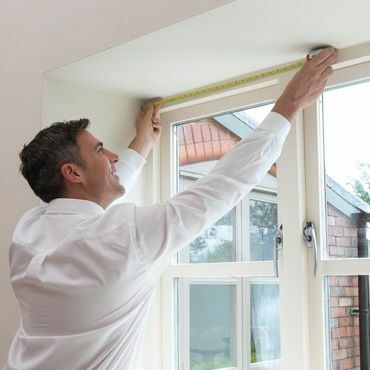 One of our advisors will come to your home, giving you the ideal opportunity to view our Roller blinds. You’ll be able to feel the fabrics and gauge how well the designs work with your décor. And you’ll be able to call upon your advisor for style tips, practical knowhow and that all important second opinion. Your advisor will also measure up and give you a no-obligation quote to consider.